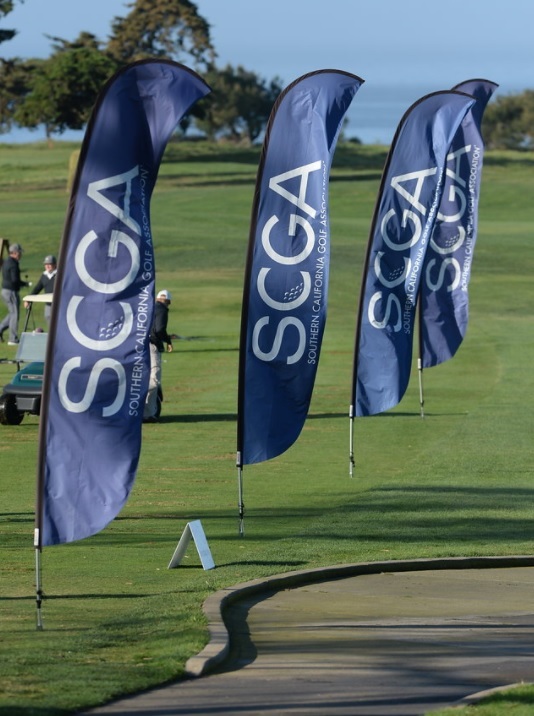 One of the most popular SCGA programs, SCGA Team Play began in 1900 and has grown to include more than 230 clubs and 8,000 participants each year. This competition is open only to regular member clubs maintaining at least one 18-hole golf course of at least 5,000 yards in length. Participating clubs may enter one 16-person team in a Thursday league, a Saturday league, or both, for each qualifying course they maintain. Clubs are arranged in groups of four, and their respective 16-person teams play a series of six home and away matches within their assigned group. All competition includes both single and four-ball match play. Group winners then meet in single elimination playoffs, culminating in an 18-hole championship. “Sunday Funday” took on a new meaning for a pair of clubs over the weekend, as the SCGA crowned two new champions in the Team Play Finals Championship at Sandpiper GC in Santa Barbara. Lifting a trophy for the first time in 13 years, Dove Canyon GC captured the Team Play Championship in the Thursday Division by defeating Braemar CC 32-16. In the Saturday Division – a rematch of the 2017 final – Los Coyotes CC earned its first-ever Team Final title by downing Red Hill CC 36-12. Sunday’s respective championship matches culminated a four-month regular season and month-long postseason at scenic Sandpiper, where perfect weather conditions created a memorable atmosphere for players, captains and spectator galleries alike. During dinner with his squad the night before the SCGA Team Finals, captain Rich Levin had a moment of clarity and was able to reflect on the significance of appearing in the championship match with his buddies. Jason Bittick set the tone for Dove Canyon on Sunday. He earned two points by defeating Braemar’s Craig Courtney 5 & 3 in singles action. Bittick also shot a net 68 and teamed with Nicholas Punto to pick up two more points with a 1-up victory in Four-Ball. Dove Canyon won five of the eight Four-Ball pairings to pull away. Levin recalled how Dove Canyon’s typical Saturday Team was converted into a Thursday Team as a result of evolving family dynamics. It took “passion and joy,” according to Levin, to emerge victorious. But he also pointed to a special group of supporters who had equal impact on the result. Before the last groups had even pulled up to the 18th green Sunday, members of the Los Coyotes CC team were already shouting “Redemption” during an unofficial celebration. One year earlier, Los Coyotes found itself on the losing end of a 29-19 defeat to Red Hill CC in the Team Play Saturday Division Championship. With revenge on their mind, however, LCCC golfers were clearly on a mission at Sandpiper, romping their way to a 36-12 win over Red Hill to win the rematch. David Ujihara, captain of the Los Coyotes CC team, shared a theory following Sunday’s final. “The SCGA should just forget the playoff rules and let us and Red Hill battle in the 2019 championship in the rubber match,” he said with a smile, when asked if the teams will make it a three-peat for finals appearances next year. Los Coyotes won five of the eight Four-Ball pairings and halved another with Red Hill. One of the most exciting victories of the day came from Byung Kim and Kyu Oh, who defeated Red Hill’s John Hadley and Campbell Finlay 1 up. Michael Im and Ken Chong both posted net 68s to lead a dominant team victory in singles play. Los Coyotes won 11 of the head-to-head matchups and halved three, earning 25 points. One of the most popular SCGA programs, Team Play began in 1900 and has grown to include approximately 230 clubs and 8,000 participants each year. This competition is open only to regular member clubs maintaining at least one 18-hole golf course of at least 5,000 yards in length. I sense a rivalry is in the works! Not Rory and Jordan; Red Hill and LACC!